The short story: We’ve written an extension to Numbas which adds a data type for handling quantities with associated units, and a custom part type which asks the student to enter a value with units. Today we’ve released Numbas v3.0. It’s the thing I’m second-most proud of producing in the last year (my daughter was born last October). The marking code at the heart of Numbas has been completely rewritten, to make it much easier for question authors to change how students’ answers are marked. This has also allowed the introduction of custom part types, to make it easier to use and reuse different marking algorithms. During our project to create material for students making the transition to university, I did a bit of development work on Numbas based on issue that our interns raised. I’ll describe those here. 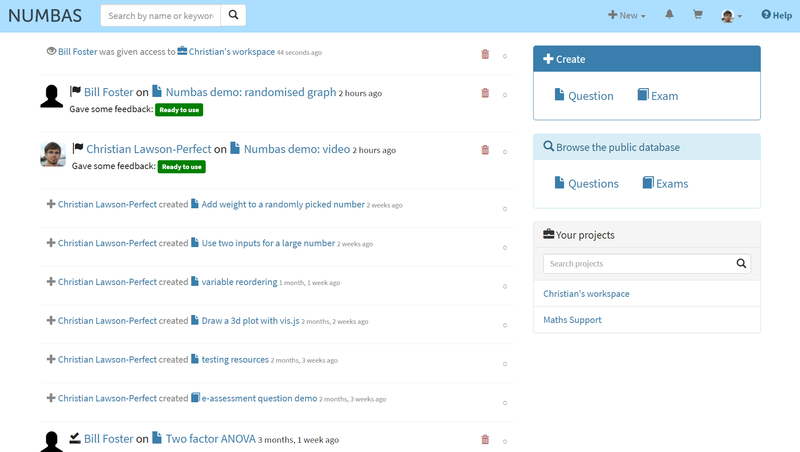 We’ve made a few changes to Numbas and the editor recently, with the aim of improving usability. It involved moving some parts of the editor around, so I thought I’d better show what we’ve done. Numbas has acquired a few new features and had a bit of a tidy-up in the last couple of months, so I thought it was time to bump the version number up to 2.1 and let you all know what’s been happening with another development log. We’re happy to announce the release of a Basic LTI 1.1 tool provider for Numbas exams. One of the more complicated parts of using Numbas is getting it to work with your Virtual Learning Environment (VLE). We designed Numbas to use the SCORM standard, which ideally would allow it to run in any SCORM-compliant VLE without any configuration or input from the server administrator. However, there have always been a couple of wrinkles in that plan: not all VLEs support SCORM, and some of those that claim to don’t do it properly. Blackboard’s SCORM player has a few long-standing bugs and missing features which mean that we haven’t recommended it for serious use. Since we can’t fix those problems ourselves, we’ve spent a long time trying to find a way work around Blackboard’s problems. Additionally, when a large contingent of Norwegian lecturers visited us for the MatRIC colloquium this April, we discovered that very few institutions in Norway use VLEs which support SCORM. Someone suggested we look at LTI, since many more VLEs seem to support it. 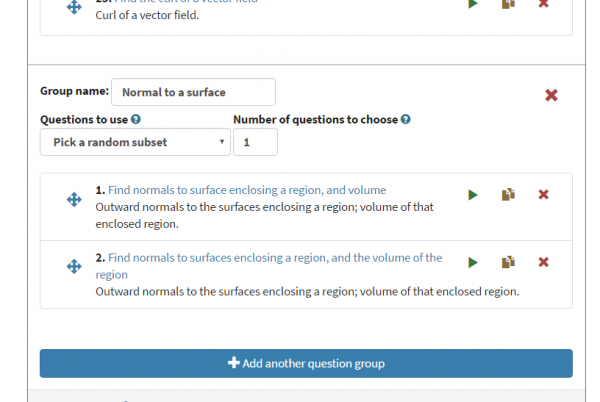 You can now embed GeoGebra applets in Numbas questions and, using GeoGebra’s new exercises feature, award the student marks based on constructions within the applet. 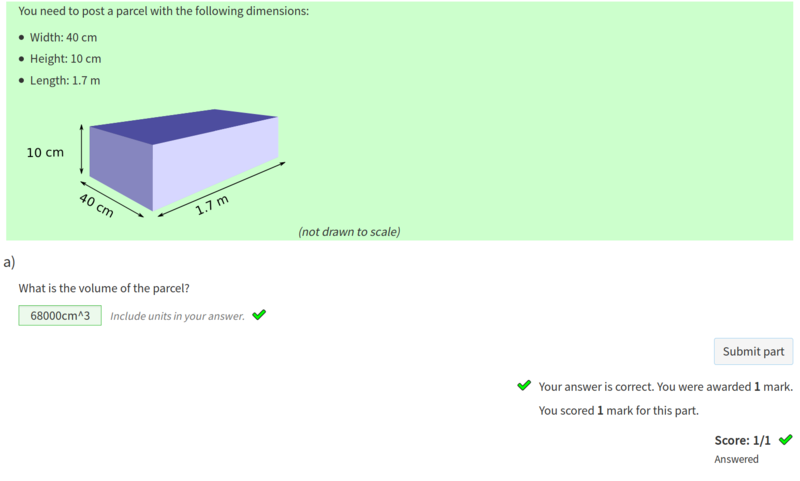 This is a huge step forward, making it much easier to include interactive diagrams in Numbas questions. Here’s a video showing how to embed a GeoGebra applet in a Numbas question, and award the student marks if they complete a certain construction. There are even steps, giving marks for each stage of the process! You can use the values of Numbas question variables in the definitions of objects in the GeoGebra worksheet, meaning that diagrams can accurately reflect the rest of your question. 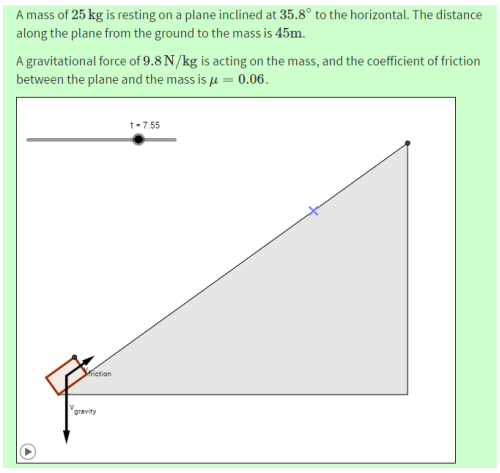 In this question, the gradient of the slope and coefficient of friction are randomly generated in Numbas, then passed to the GeoGebra applet. I’ve put together a small demo exam with a couple of questions showing some ways you can use GeoGebra inside Numbas. To get started using GeoGebra in your own Numbas questions, read the extension’s documentation. I’m very proud to announce the release of Numbas 2.0, which features a completely rewritten editing interface and a reorganised item database. We’ve added some very helpful new features, and changed the way the database is organised to make working in groups much easier. All exams and questions in the editor database are now organised into projects, which provide a simple way of collecting together material relating to a particular course or activity in one place. Projects allow you to automatically grant editing rights to a group of collaborators, keep track of changes that have been made to your content, and filter out irrelevant material. 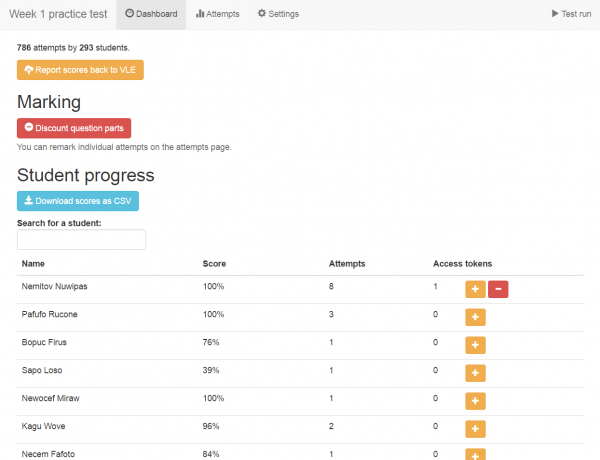 Project-level comments make it easier to coordinate writing, testing, and deployment of questions and exams with your team members. We’ve rebuilt the editing interface from the ground up, to make it cleaner and easier to use. The current situation at Newcastle is that all of our in-course Numbas tests which count towards credit are run through a Moodle server set up specifically for the purpose, even though our institutional VLE is Blackboard. The reason for that boils down to the fact that Blackboard doesn’t make it easy to analyse data to do with SCORM packages: the built-in SCORM reports don’t give much useful information and are tedious to generate, and it’s unclear where in the database the SCORM data lies. If a student claims that their answer was marked incorrectly, we have no way of checking it because Blackboard only gives you the student’s reponse to an interaction, and not the expected response. And sometimes that’s not enough: it’s much easier to work out where a student’s gone wrong if you can load up the test as they saw it. SCORM has a review mode which does that, and while I was able to add support for that to the open-source Moodle server, Blackboard is a black box and brooks no intervention. Can you work out where this student went wrong? Development of Numbas has continued apace over the Summer break. I’m about to go on holiday for a couple of weeks, so I thought I’d write a development log to keep you up to date with all the latest changes. The biggest change is that I completely rewrote the default theme to use the Bootstrap framework. As well as making everything look more “modern”, it should make using Numbas on smaller screens a lot easier. When the screen is below a certain width, the question list collapses into a sliding menu, which you can reveal by clicking on the icon at the top left of the screen. The old layout, with all the navigation bumped to the bottom, led to a lot of scrolling up and down.